Where can I get night flowering jasmine (Nyctanthes Arbor-Tristis) in Sydney? 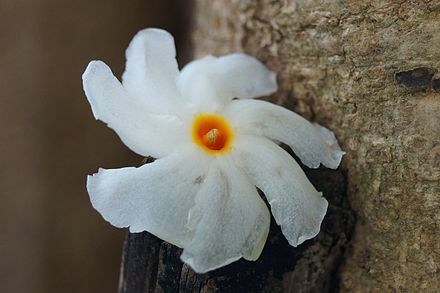 it is a jasmine type of flower with white petals and orange stem. flowers at dusk and the flowers drop off by morning. There are a few companies which sell seed of this plant if you do a Google search - also on the permitted AQIS list! GS wondering if you were able to get Nyctanthes arbor-tristis as I am looking for that. I am based in Melbourne. or plant , i have emailed you too. I need this same plant called Nyctanthes arbor-tristis (Night-flowering Jasmine) in Sydney. The flowers are fragrant, with a five- to eight-lobed white corolla with an orange-red centre; they are produced in clusters of two to seven together, with individual flowers opening at dusk and finishing at dawn. postage is hard & not possible. Do you post Nyctanthes arbor-tristis plants/seeds to Darwin NT. Could you please let us know if you still have the Nyctanthes arbor-tristis plant. I would be interested to purchase one. Contact me at luu888@hotmail.com if you want this plant I’m in Sydney.